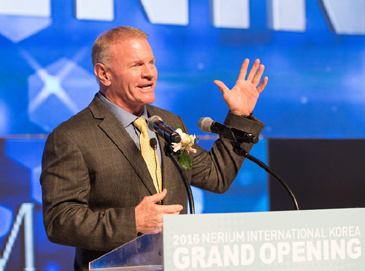 CEO of Nerium International, Jeff Olson,delivers a lecture on conferene on Kintex Ilsan to celebrate the its grand opening on March 5, 2016. Nerium International Korea, global premium skincare company headquartered in the U.S, held a conference at Exhibition Hall 1 of Kintex located in Ilsan west of Seoul in order to celebrate the launch of "Memory Formula" on March 5, 2016. Jeff Olson, CEO of Nerium International, participated in this conference and shared business performance in South Korean market. Nerium entered the local Korean markt in July, 2015. Also, a team of its executives and senior researchers of Signum Bioscience – which leads to developing the products of Nerium – shared main ingredient and competitiveness. Especially, as Kim Jun-bae, CEO of Cosmax – produces Nerium Age Defying Night & Day Cream Optimera plus Formula in Korea and handles total distribution in Asia – attended and suggested visible vision. He received a positive response from the participants. Nerium International is connection marketing company headquartered in Addison, Texas, U.S., which provides products made of differentiated ingredient and technology. Since its establishment in August of 2011, it has reached new record in revenue, creating about a million of its fans. It has received a keen attention from the industry. Nerium, which is operated by professional management, provides quality of products based on dermatology. Also, under the mission of "Making People Better," Nerium has concentrated on developing skincare products which could improve customers’ life.